In the Roman Catholic Church, a parish (Latin: parochia) is a stable community of the faithful within a particular church, whose pastoral care has been entrusted to a parish priest (Latin: parochus), under the authority of the diocesan bishop. It is the lowest ecclesiastical subdivision in the Catholic episcopal polity, and the primary constituent unit of a diocese. In the 1983 Code of Canon Law, parishes are constituted under cc. 515–552, entitled "Parishes, Pastors, and Parochial Vicars." Most parishes are territorial parishes, which comprise all the Christian faithful living within a defined geographic area. Some parishes may be joined with others in a deanery or vicariate forane and overseen by a vicar forane, also known as a dean or archpriest. National parishes, established to serve the faithful of a certain ethnic group or national origin, offering services and activities in their native language. Parishes established to serve university students. Anglican Use parishes established by the Pastoral Provision or other dispensations for former members of the Episcopal Church in the United States. By nature, communities belonging to the personal ordinariates for Anglicans as established by Anglicanorum Coetibus of 4 November 2009 are also personal parishes. All the Christian faithful who reside in a territorial parish are considered constitutive of that territorial parish, and all members of a community for which a personal parish has been erected are similarly members of that personal parish. Membership should not be confused with registration or worship, however. Catholics are not obliged to worship only at the parish church to which they belong, but may for convenience or taste attend services at any Catholic church. The term "church" may refer to the parish – the community that meets together – or to the building. In this article it is used to refer to the building. In American usage, a "parish priest" is any priest assigned to a parish even in a subordinate capacity, and some may be designated as associate pastors or assistant pastors. Globally they may be known as assistant priests, parochial vicars or curates. In addition to the parish priest and any assistant priests he may have, a parish commonly has a staff of lay people (vestry), religious, and ordained deacons. For example, a parish secretary may assist in administrative matters, a parish sister in activities such as visiting the sick, and a perhaps married permanent deacon in sacramental as well as pastoral or administrative duties. A parish is obliged to have a finance committee and, if the bishop considers it opportune, a pastoral council or parish council. The finance committee and pastoral council are only consultative. Often the parish council is elected, to be broadly representative of the parish community, while members of the finance committee are more often appointed by the pastor according to their expertise. In addition to a parish church, each parish may maintain auxiliary organizations and their facilities such as a rectory, parish hall, parochial school, or convent, frequently located on the same campus or adjacent to the church. 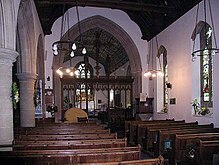 Each parish has a single seat of worship, the parish church. Geography, overcrowding, or other circumstances may induce the parish to establish alternative worship centers, however, which may not have a full-time parish priest. The parish church is the center of most Catholics' spiritual life, since it is there that they receive the sacraments. On Sundays, and perhaps also daily, Mass is celebrated by a priest resident in the parish. Confession is made available, and perhaps Vespers in the larger or more progressive parishes. There are also laity-led activities and social events in accordance with local culture and circumstances. Many parishes in different parts of the world operate schools for the children of the parish, though their organization, staffing, and funding varies widely according to local practice. However, many parishes cannot support schools alone, and there may be regional schools run by some parish or by the diocese. In addition to the standard curriculum, students at parochial schools are given moral and religious education in line with the teachings of the Catholic Church. A parish has two constitutive elements: a body of Christian faithful and a parish priest (called the pastor in the United States) to serve their spiritual needs. The parish is a "juridic person" under canon law, and thus recognized as a unit with certain rights and responsibilities. It is not autonomous, however. The diocesan bishop has the sole power to erect, suppress, or alter parishes, after consulting with his Presbyteral Council. parishes in which apostolic activity can be performed only with difficulty or less effectively because of the excessive number of the faithful or too vast a territory or for any other reason, be suitably divided or dismembered according to the various circumstances. Likewise parishes which are too small should be united insofar as the situation demands it and circumstances permit. Where a parish priest has been named to pastor a defined community, but circumstances do not permit it to be formally erected as a parish, the congregation is recognized as a quasi-parish. Quasi-parishes would be found in new mission churches, called "missions" of the mother parish, in new neighborhoods, and in communities too small to support their own priest. the name of a blessed, but only with the permission of the Holy See. If two or more parishes are merged, the church buildings of each parish retain their names, but the parish itself may adopt a different name for pastoral reasons. Suppression is a Catholic term for the formal disbanding of a parish or other ecclesiastical entity. It differs from the more common practice of merging parishes. Suppression only occurs when the Church believes the entity of the existing parish cannot continue. This includes cases such as bankruptcy, abuse, or deviations from canonical teachings. In practice the parish is merged into others after a suppression, as the geographic area must by canon law be covered by other parishes. [O]nly with great difficulty can one say that a parish becomes extinct. A parish is extinguished by the law itself only if no Catholic community any longer exists in its territory, or if no pastoral activity has taken place for a hundred years (can. 120 #1). When a parish is "suppressed" by competent authority, in reality, the still existing community of Christ's faithful is actually "merged" into the neighboring community of Christ's faithful and constitutes a larger community, and the territory of the extinguished parish is added to the other, forming a larger territorial unit. Parishes are typically suppressed or merged when they become unsustainable due to a decline in the local Catholic population. For example, given the ongoing priest shortage, a bishop may wish to reallocate clergy serving a small parish so that they can help serve a larger one, or a decline in contributions may make upkeep of a large, old parish church economically impossible. The merger or suppression of a parish does not necessarily require that its parish church or other operations be closed, however. The former parish church may be retained as an alternative worship space, for example, or converted for other pastoral use. Controversy has arisen in the United States over the suppression of parishes, and over the disposition of parochial assets and liabilities following such a change. Some bishops have interpreted suppression as equivalent to the extinction of a parish under canon 123 (as due to war or disaster), in which case the assets and liabilities of the former parish revert to the diocese. In most cases, however, the local Catholic population was stable, and could not be said to be extinct, and so they should have been distributed to the successor parishes, as the Congregation for the Clergy emphasized in 2006 letter to the USCCB. In other cases, parishioners have objected to the closing of churches, making administrative recourse to the Vatican and staging sit-in protests at churches in Boston, Springfield, and Worcester, Massachusetts; Allentown and Scranton, Pennsylvania; and Syracuse and Buffalo, New York. In 2010 the Supreme Tribunal Apostolic Signatura, the highest court within the Catholic Church, overruled bishops, ruling that the closing of churches in Springfield, Allentown, and Buffalo was unnecessary and thus not permitted under canon 1222. ^ Bruce, Tricia Colleen. Parish and place : making room for diversity in the American Catholic church. ISBN 9780190270346. OCLC 999442986. ^ "Motu Proprio Summorum Pontificum on the "Roman liturgy prior to the reform of 1970" (July 7, 2007) | BENEDICT XVI". www.vatican.va. Retrieved 2017-07-21. ^ "THE CORRECT MEANING OF "CHURCH" AND "ECCLESIA"". www.aggressivechristianity.net. Retrieved 2017-07-21. ^ Note that in the 1917 Code of Canon Law, the definition of quasi-parish differs. Quasi-parishes existed only as divisions of apostolic vicariates or apostolic prefectures, and were led by quasi-pastors. In the 1983 code, quasi-parishes are led by pastors and can exist anywhere. Bruce, Tricia Colleen. 2017. Parish and Place: Making Room for Diversity in the American Catholic Church. New York, NY: Oxford University Press.